Hope you have a fun week ahead. This will be my long work week. It sure is nice when there's only four days to work instead of five. I have been busy this weekend getting done with my two monthly challenges. I finished this Anvil block late Sunday night. It is the second of the two to finish in April. I'm quilting along with Jo's Country Junction's Quilt Square Quilt Along. 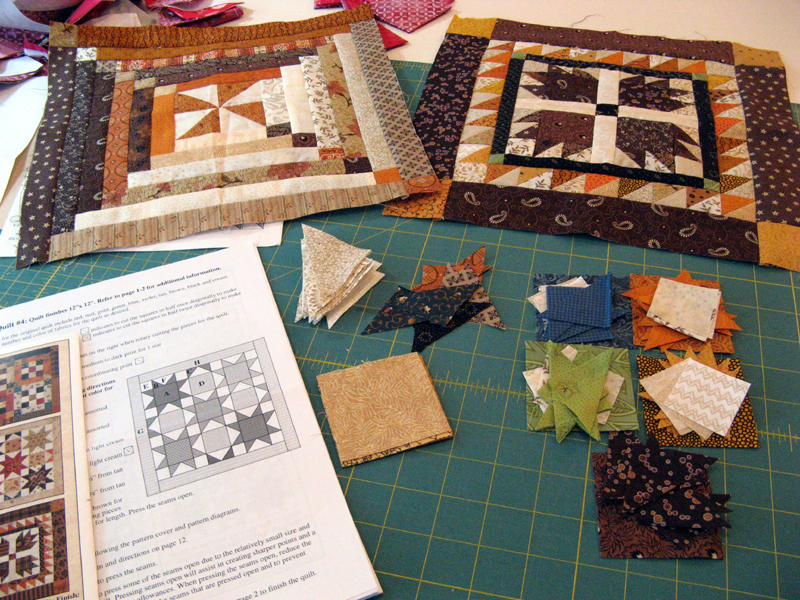 Jo's selecting a block from three patterns (each with six small quilt patterns) designed by Lori Smith. April's selection was "Your Choice". I really like the Anvil block and knew right from the beginning I'd be making it. I've only got one other color to bring more into the next eight blocks. 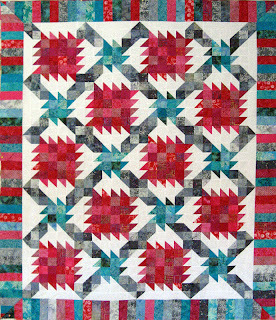 It's a teal print that you might be able to glimpse in the Stars block in the middle on the top. My April UFO is complete. 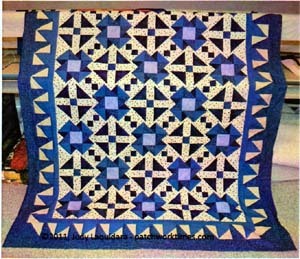 This is Kommodore designed by Judy Laquidara; her Indigo. Judy has it offered for free on her website if you want one of your very own. I didn't put the last border on to keep it a bit smaller. I'll follow her idea with the coloring and use the red violet or the medium purple for the binding. The fabric below came from Kerry's stash. It looks a bit pink here but it does work well so I'm planning on using it. 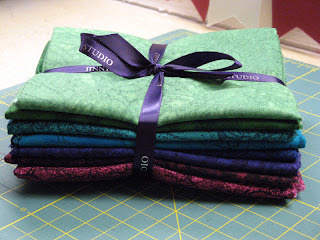 In looking through the stash of quilting threads a variegated green looked like it might be a winner for the quilting. Bring on May's UFO! Let me introduce you to Kruizer! I was so excited to have him complete during the class. He's got silver paw print buttons holding up his britches. There were ten of us in the class which made for a full house in the cozy class space at Country Loft in La Mesa, CA. Several were working on other dolls during the day. That's a nice thing about JoAnn the instructor. She makes it so easy to make one of her dolls. 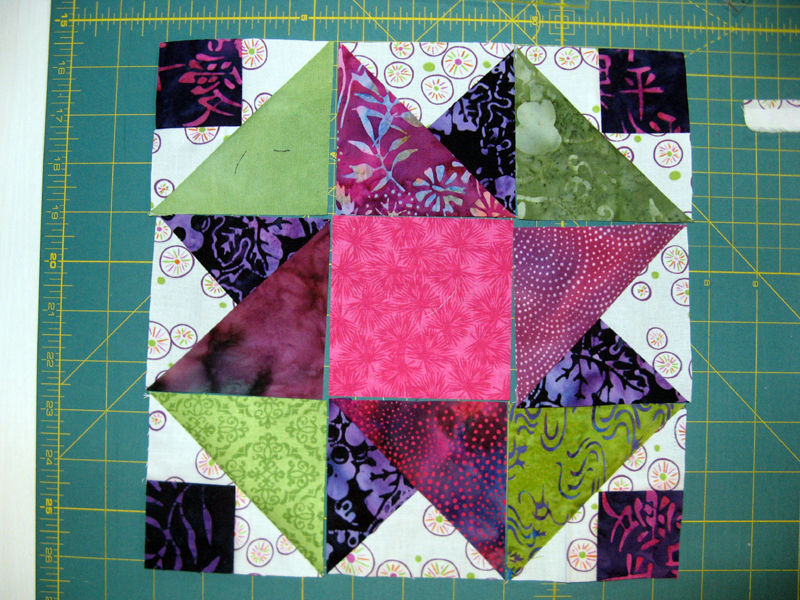 It's still early yet in San Diego giving me plenty of time to complete Quilt Square #4 of Lori Smith's design from Quilt Square Pattern #1. This project is also a monthly one that needs to be done before tomorrow is out. 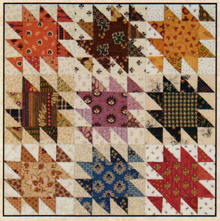 If you want to join in on the fun of the Quilt Square Quilt Along check out Jo's Country Junction to see what everyone else creates. So my stash report is pretty good today. 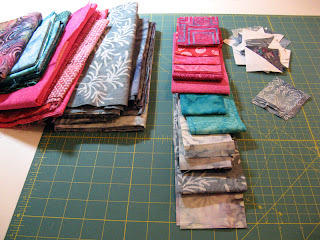 I've got the fabric to count for Kommodore and thanks to Kerry nothing to report as purchased! Here's Kommodore so far. I've got it up on my wall with the usual blue painters tape. One day I'll make it a real design wall (hubby gave me the green light!). 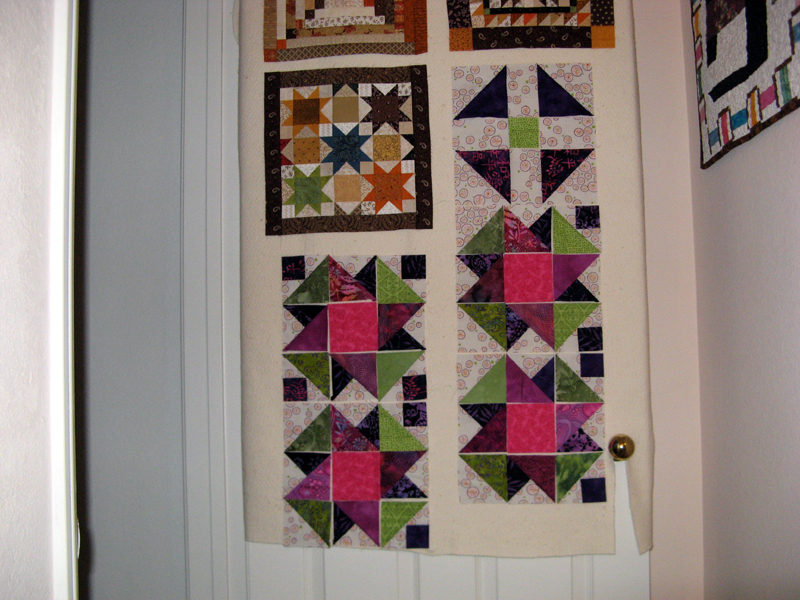 I still have a bit of rearranging to do with the blocks before I sew them together. 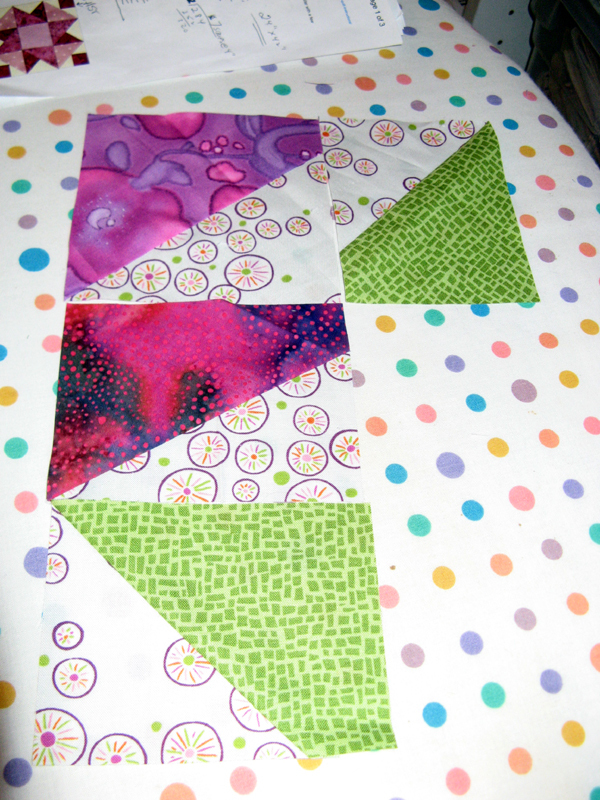 The green is the first border that is all one fabric instead of making it scrappy. I thought it would calm the middle a bit before the scrappy pieced border. 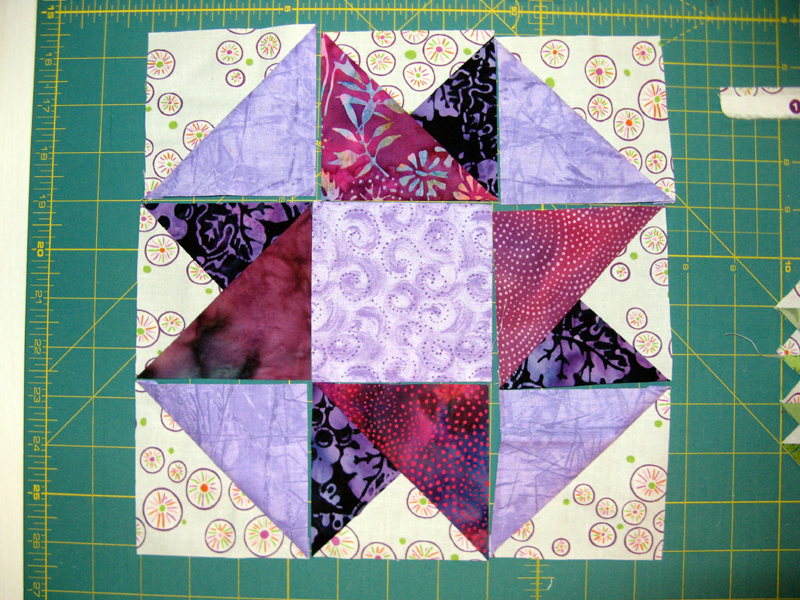 I'll be finishing it off with the binding in a medium purple; probably again with one fabric. I don't have enough of any of the fabrics I have left in this shade so it will probably be a purchase...unless one of my friends has something they want to rid from their stash :)! 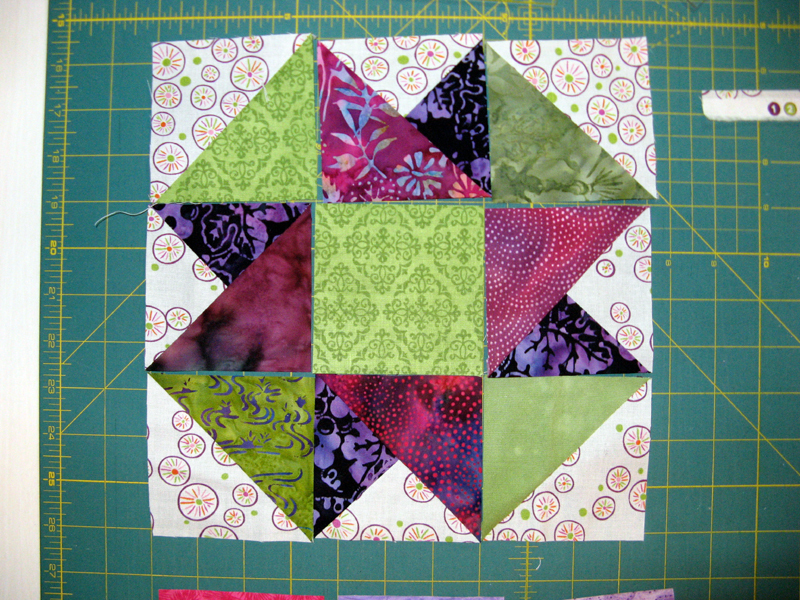 The pieced blocks on the top are the way the project is designed, but I like the green together around the corner like the layout below. Any opinions? Have a wonderful finish to this week. May is just around the corner. Do you have all your challenges for the month done? Here's my sewing room today. I have Kommodore (Judy Laquidara's design Indigo) in various stages of completion. I'm working on all the components and then the blocks will go together. Thanks on all the comments about color to use for that center square. I didn't have any other pinks to audition that looked "less intense" as many of you suggested I try. This one will work and better yet it is stash to use! It should be pretty quick to get it done now. The end of the month is fast approaching. 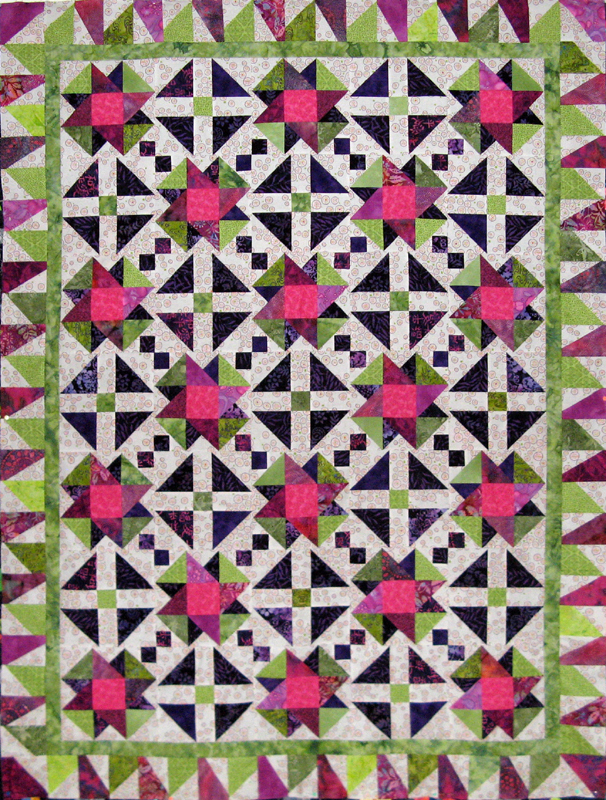 I've also got my fourth Quilt Square with Jo's Country Junctions (Lori Smith's designs from Quilt Squares #1). I'm going to be busy this week! See other projects via the links on Judy's Patchwork Times. Have a nice week! I'm continuing to work on my April UFO. I have just a bunch of components so I didn't bother with a photo for this post. 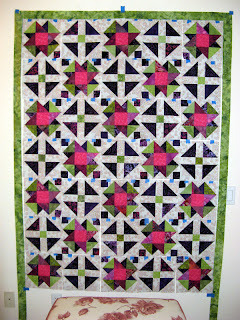 I do have a little eye candy to share...this is Joan's Chunky Churndashes quilt. 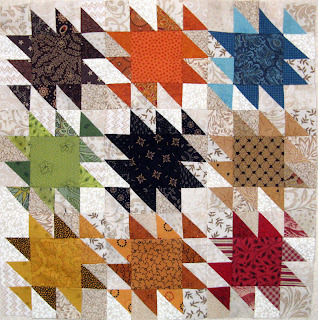 She used green and brown with a contrasting corner stone in the inner border. Her hour glasses look to be a brown on the gold side. Nice work Joan! These next photos are of HSTs without the dark corner square. 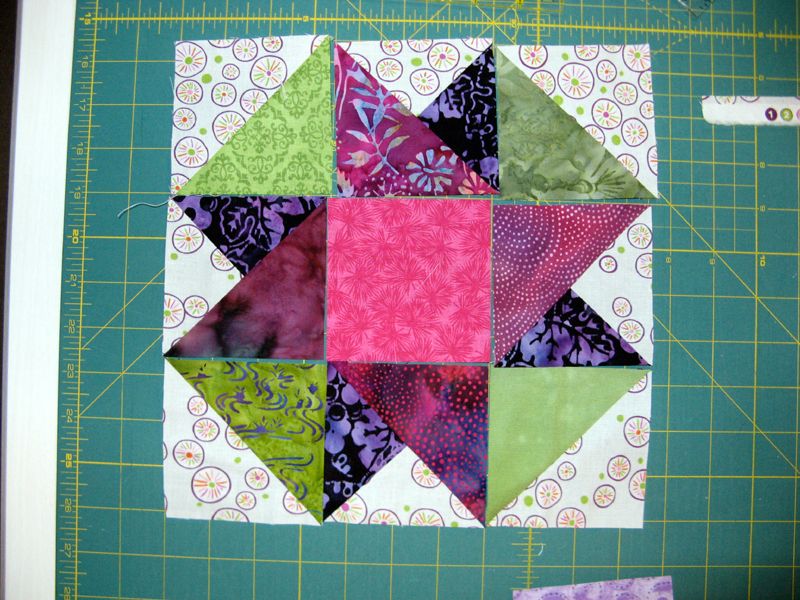 These first four are green with the different center colors as in the Block A above. There are two other blocks that are variations of Block A with quantity of the corner patch (with the square) not being in each corner. The Block D which I've not shown is the dark purple and either the medium purple or green 2" square in it's center. I hope the samples are enough for you to help me decide. This is my April UFO...eeks...with not much time left in this month decisions must be made :)! 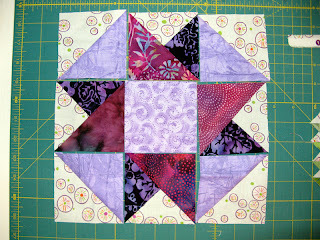 The pattern I'm using is Judy Laquidara's Indigo on her website Patchwork Times under Free Patterns. 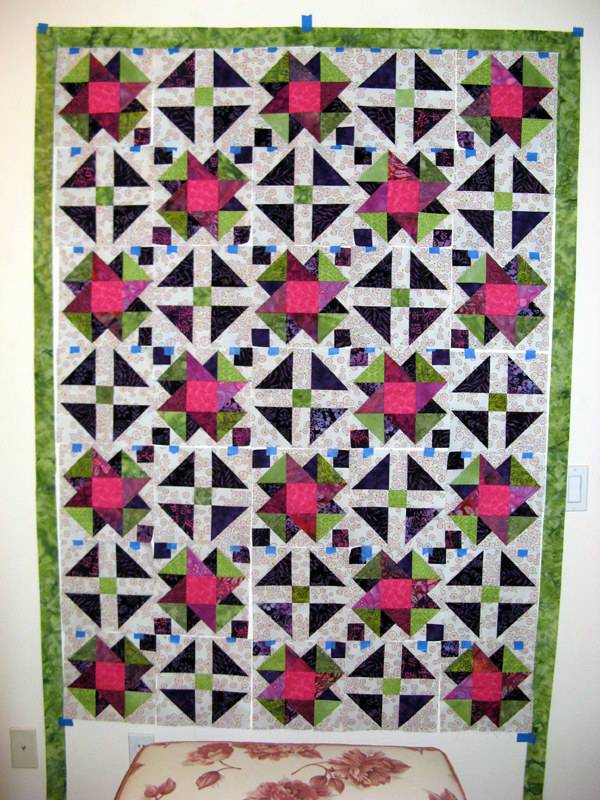 Another Chunky Churndashes Finish! This one is Kerry's. 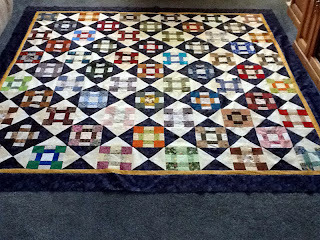 Our Churndashes Block Swap started in November 2011 and finished in February 2012. 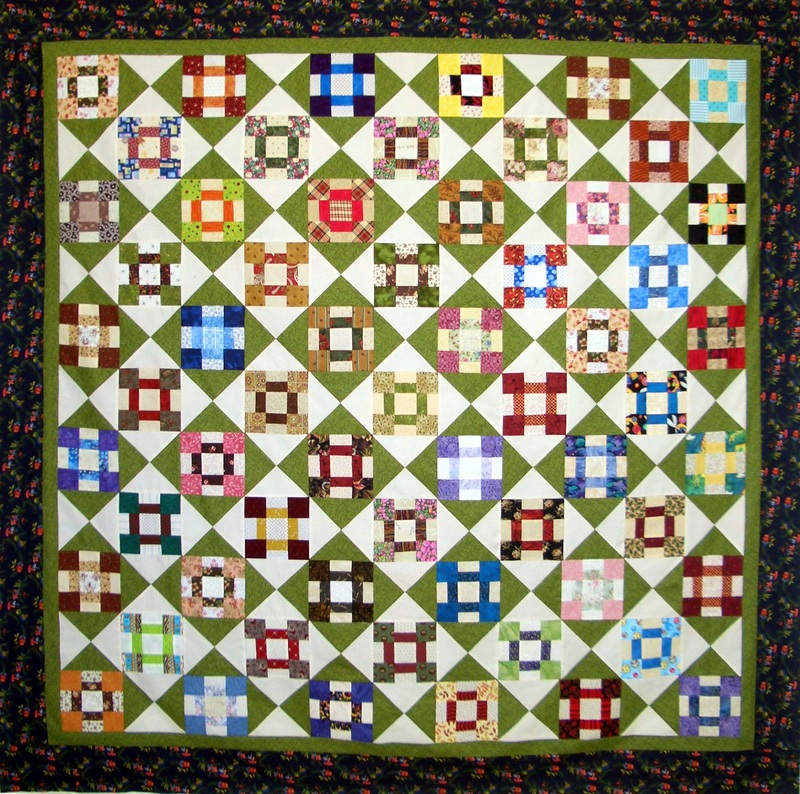 Each and every quilt has turned out different. So far the hour glass block has been in purple, blue, red, and now green. There are still several others to finish...wonder what's next? If you want to see the ones before search on the label Churndash Swap on the side bar. The background fabric for my April UFO with Patchwork Times is enroute from Keepsake Quilting. Once it arrives I'll be racing to get Kommodore done before the end of the month. 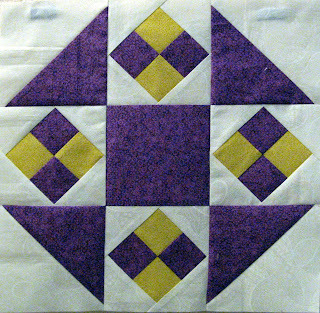 Its Judy's Indigo design free on her website. 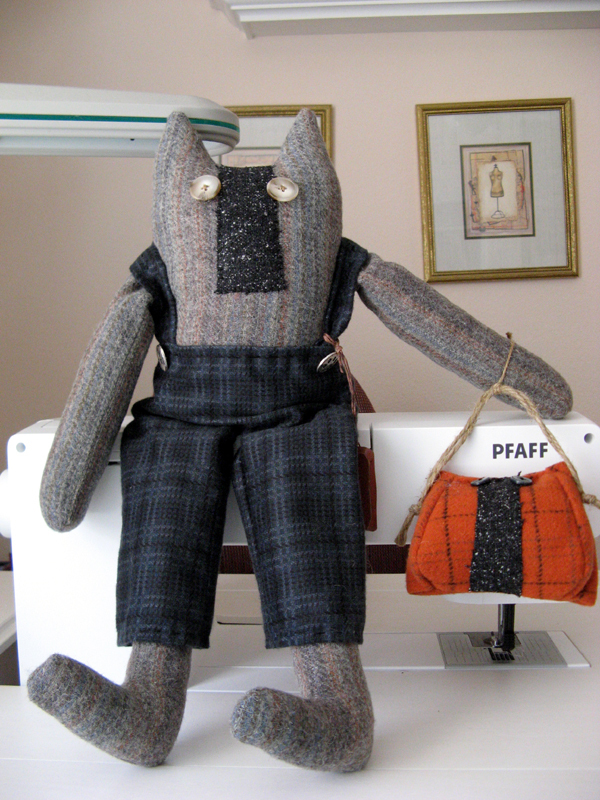 Hope you have a nice week spending time in your sewing room. 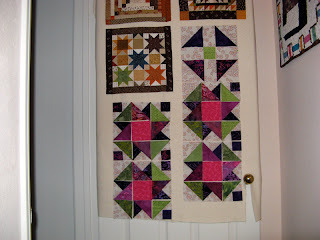 Check out others design walls via Patchwork Times. Today I've got great stash news! I've not only finished Klunky Korners...I've also finished Kerfuffle. 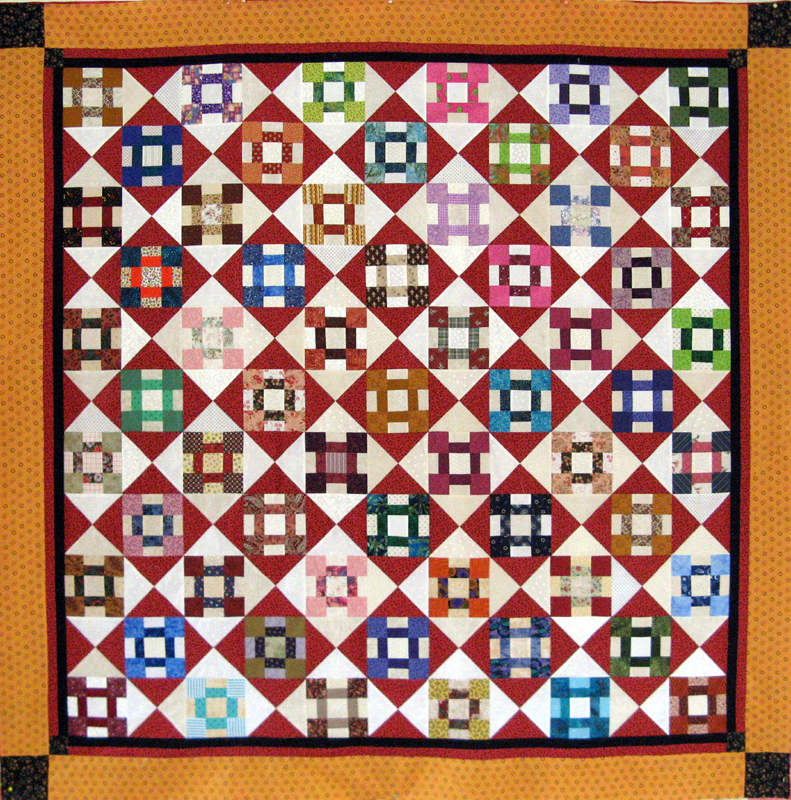 Klunky Korners is my Chunky Churndashes by Bonnie Hunter. 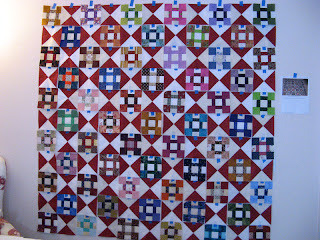 (She's got it free on her website www.quiltville.com). The border is one that she suggested, but of course you can do just about anything you want. 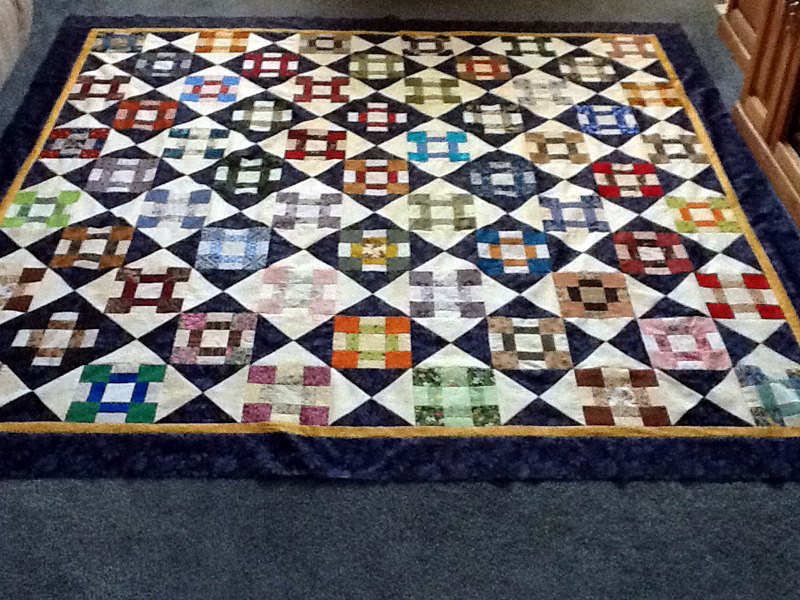 This project was made with several others in a churndashes block swap. Kerfuffle is my Autumn Rush by Myra Mahy. 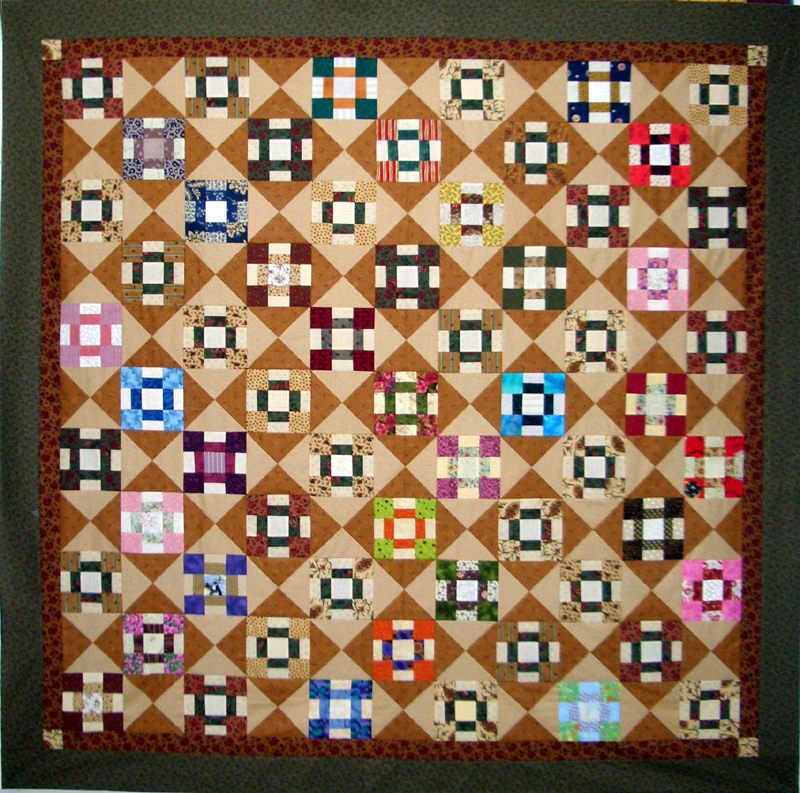 (Available on her website www.countryfaces.com) I started this project in a workshop with other quilters from Sunshine Quilt Guild a few weeks ago. Here is where I begin today. 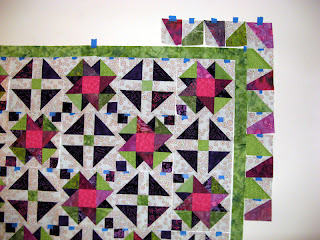 I stayed up a bit after my bedtime to finish assembling the blocks into rows and then together for Show and Tell at Sunshine Quilt Guild monthly meeting tonight. Participants of workshops usually display their progress as a group the following meeting after the event. This is that meeting for Autumn Rush. Myra Mahy became a member of the guild last meeting so I'm hoping she will be at the meeting to see how we all did. 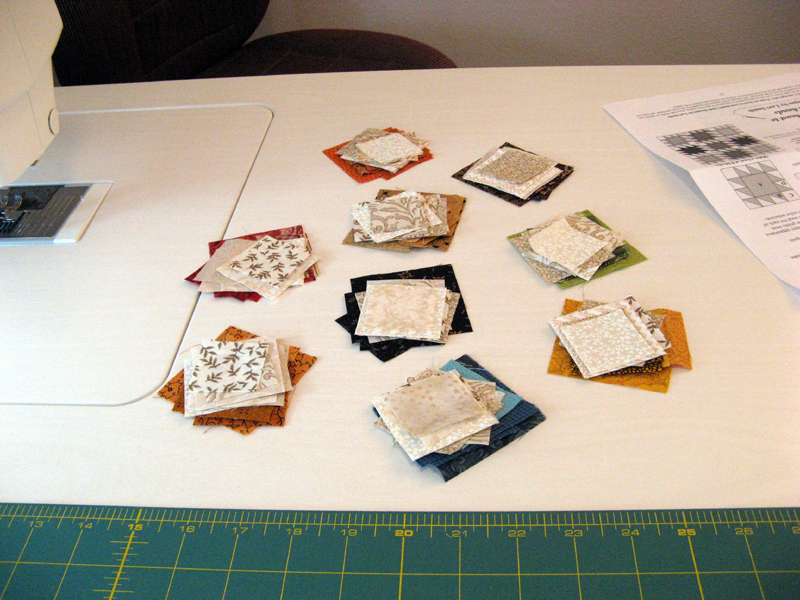 These pieces are all that I'll need to finish the remaining borders. 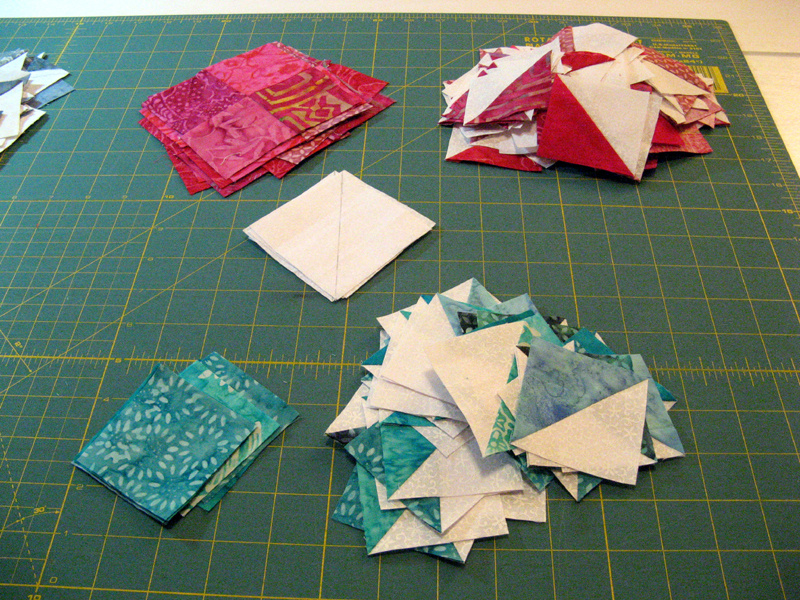 I didn't count the quantity of gray/white HSTs so who knows perhaps there will be more needed...or not. San Diego is expecting rain later tonight. I hope it holds up until after I'm home from the meeting. Until next time! Back to the work week. The weather sure has been wonderful which makes it hard to spend 9 hour days indoors :(! I've got two things scheduled this week one is the dentist for a cleaning (not too bad) and the other is the April Sunshine Monthly Meeting. 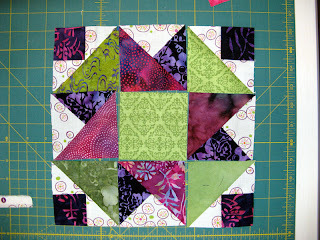 This month we made a pretty block for the BOM. Done in purple, white, and a supplied yellow. 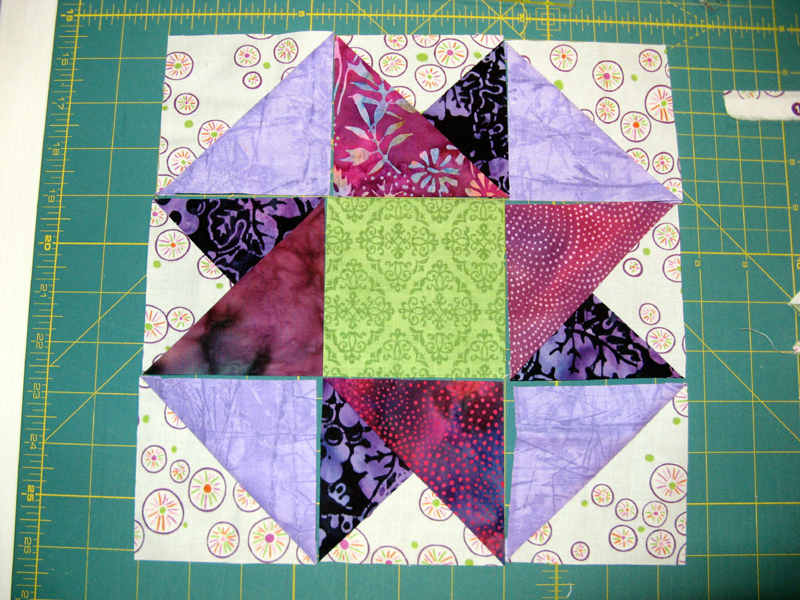 It's called a butterfly block. I suppose the four patches on point are the butterflies. I'm anxious to see all the other purples being used. I'm continuing on Autumn Rush. I've got seven more pink blocks to assemble. 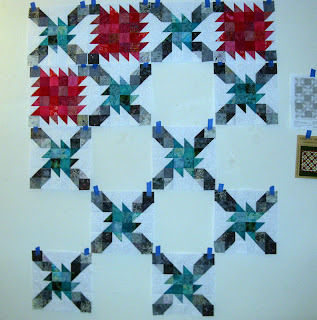 There is a white pieced inner border, the piecing will be with more gray/white HSTs. 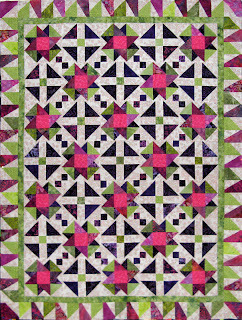 It appears that I got a little carried away making pink/white and teal/white HSTs...of well there is always another project that will use them. 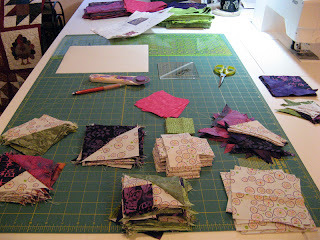 I'll be checking my mail for a package from Keepsake Quilting this week as I'm expecting the background fabric to be delivered for my April UFO (Indigo). I'll need to get going on this one right away...April is slipping right by. It's been a productive day for my Autumn Rush project. I have been working through the week on all the components. Trimming and Spinning the Seam... Took quite a bit of time, but I think its been time well spent. I have seven more pink blocks to finish, a small inner border and then it gets a piano key border. 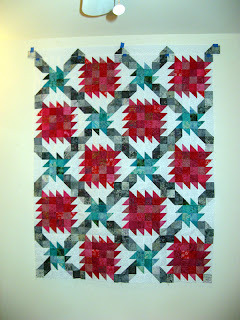 Unfortunately that didn't get Klunky Korners (Chunky Churndashes project) off the wall. This means that nothing to show as used this week. 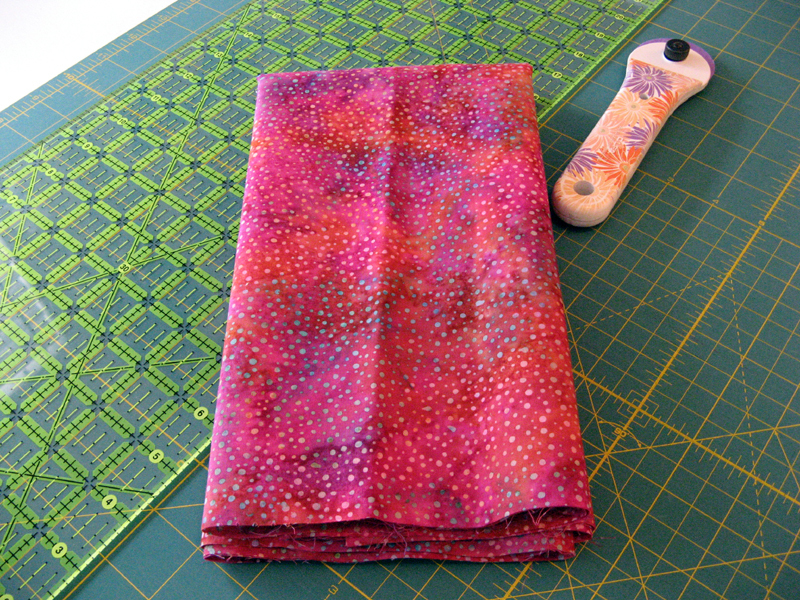 I've ordered the background fabric that I'll need for my April UFO (Indigo). 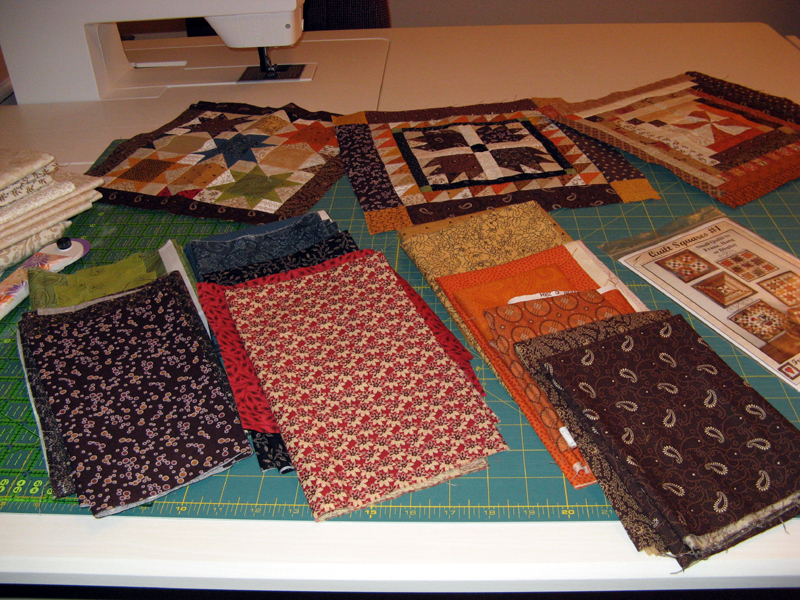 I'm hoping to get both the Autumn Rush and Klunky Korners projects finished before it arrives. 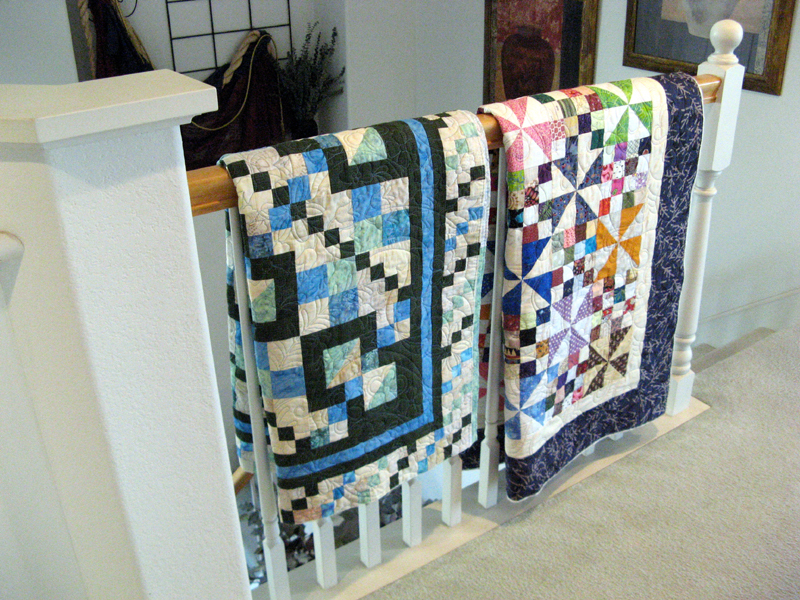 I did get two quilts back from Kerry. Kontinuum (Connect the Dots) and Komplikated (Patches and Pinwheels) are ready for binding, sleeve and label. 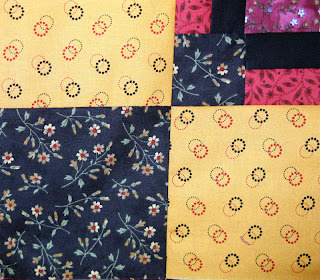 The quilting is just beautiful. I'll share how the blue thread on the deep green of Kontinuum appear to glow when I'm a little further along with the binding. So here's my report for this beautiful day. 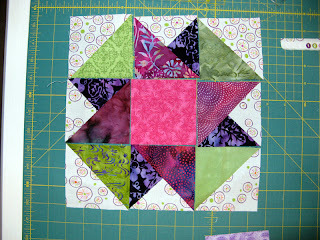 Here's my third block in Jo's Country Junction's Quilt Square Quilt Along. It looks pretty good with the other two made so far. I brought in the green from the second block and added three other colors; blue, red, and teal. 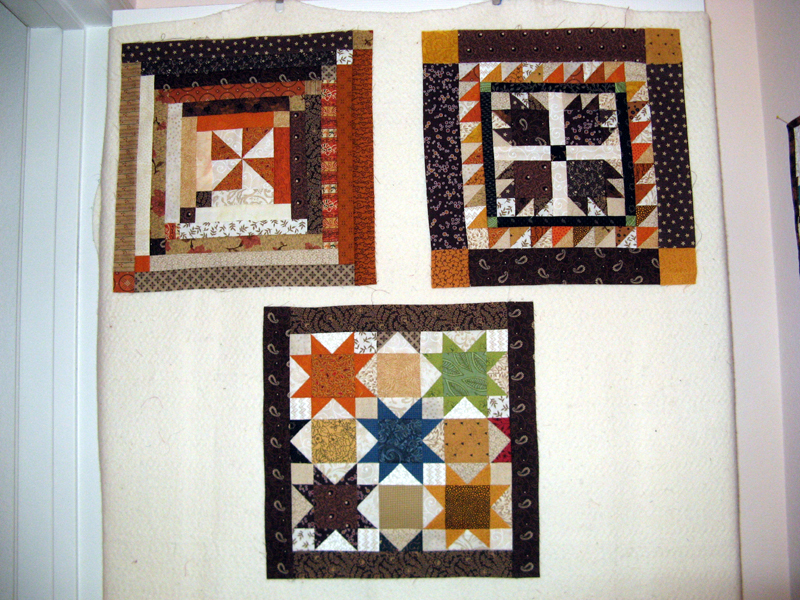 These designs are from Lori Smith's Quilt Squares #1 pattern. 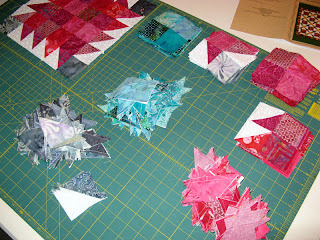 Next we will be working on Lori Smith's Quilt Squares #4 pattern. Don't know which one we'll be stitching up first, but I'm anxious to find out! 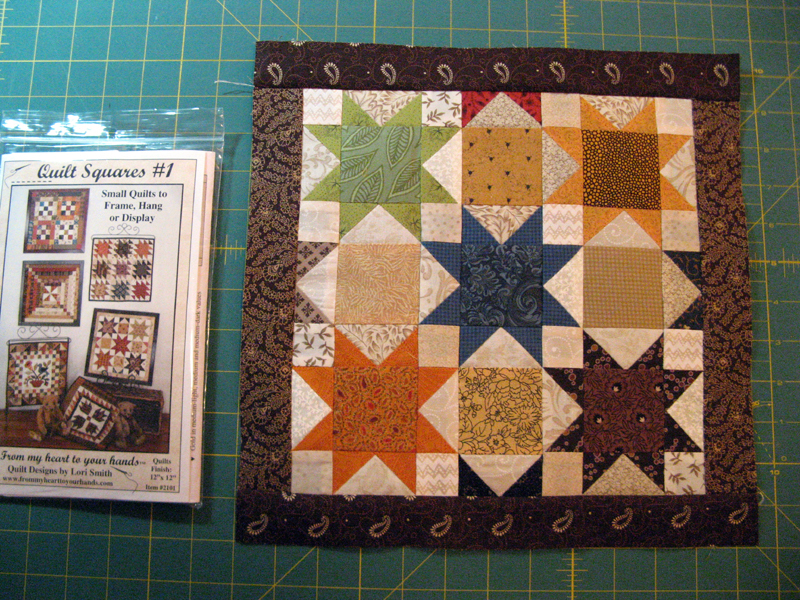 I have lots of components done on Autumn Rush that is a design by Myra Mahy. These are the first blocks in the project to finish. There are only two block designs in the project. The gray makes a chain throughout the top. 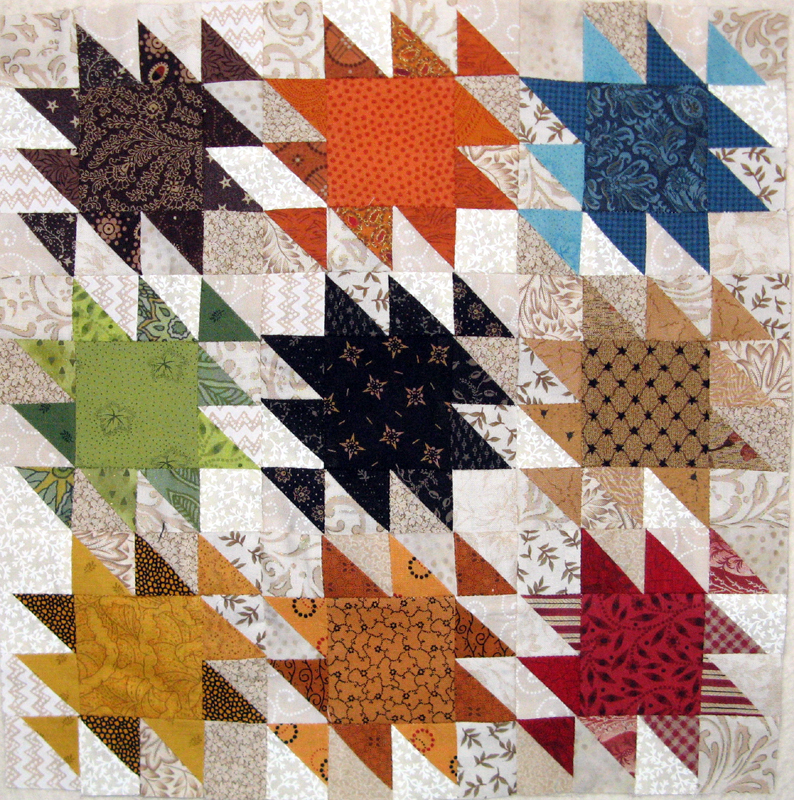 The border is a piano key design that uses the leftovers. 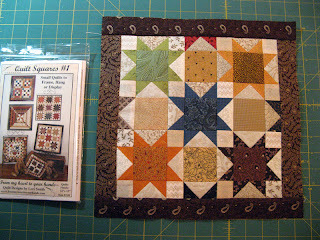 I'll be full steam on this one until I can find the fabrics for my April UFO with Patchwork Times. 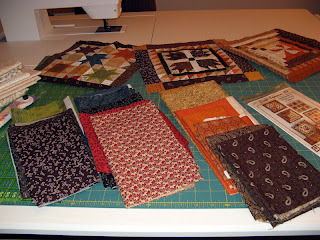 Finally a big thank you to Gail for gifting me this nice FQ bundle. Gail was in Virginia recently and stopped by Jinny Beyer Studio in Great Falls. She was so sweet to think of me. She didn't have any idea what fabrics I'd be excited to receive so she said she went with what she liked. What's not to like with this selection? Hmm wonder if she's giving me a hint? 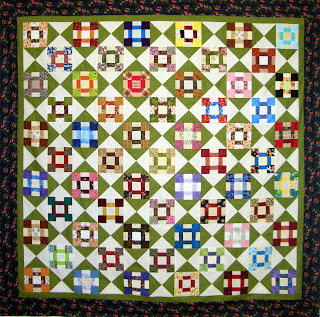 Monday I got an email that Debbie A had finished her Chunky Churndashes project. 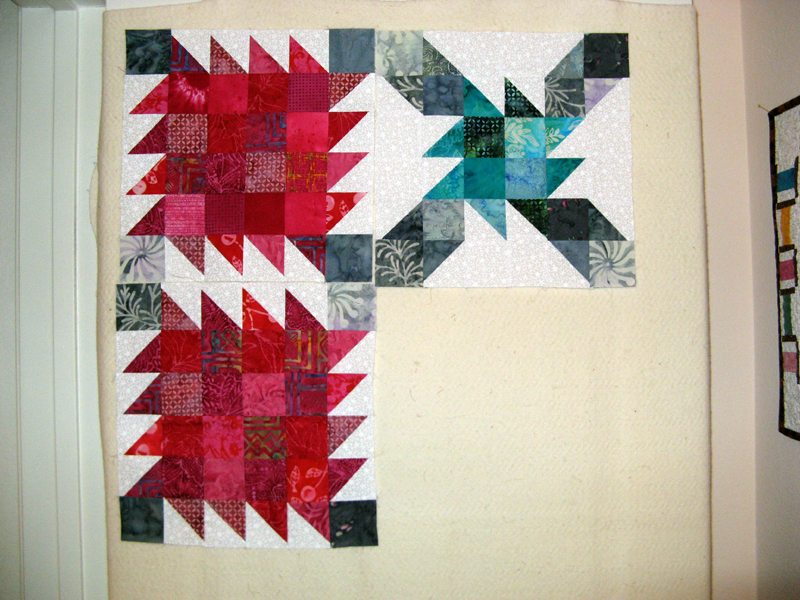 Debbie makes two of the 16 that swapped blocks to finish. 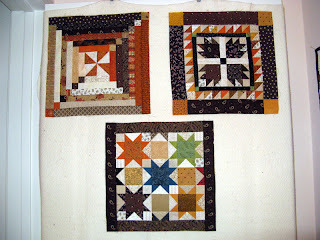 Each and every one are so different depending on the hour glass block fabrics and the two borders. There is a red one and a green one not far behind. 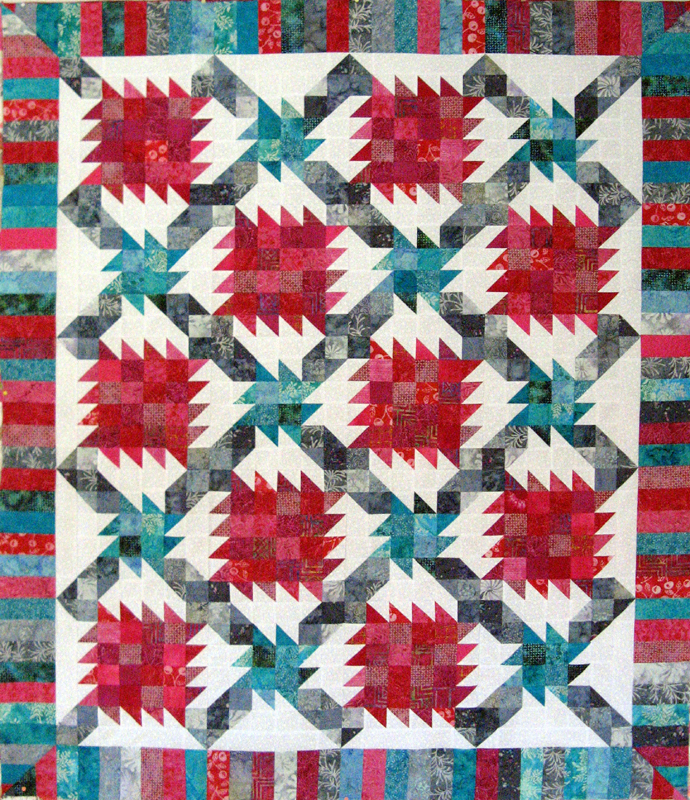 You can find this project on Bonnie Hunter's Quiltville website. 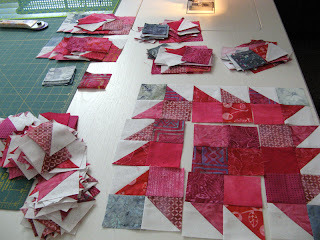 Today starts out with sewing rows together on my third block of Jo's Country Junction's Quilt Square Quilt Along. 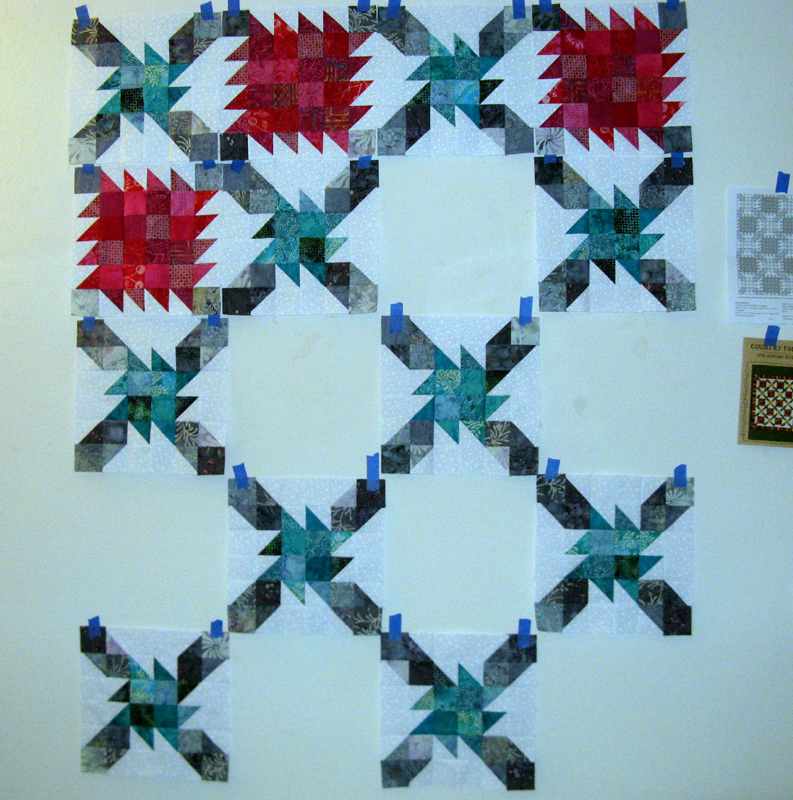 I've got the piecing done and like the addition of the blue, teal and red. I've also brought in more of the green that was in the second block. Next to decide is what borders I should use. I'm thinking to stay with browns. Any ideas on this? 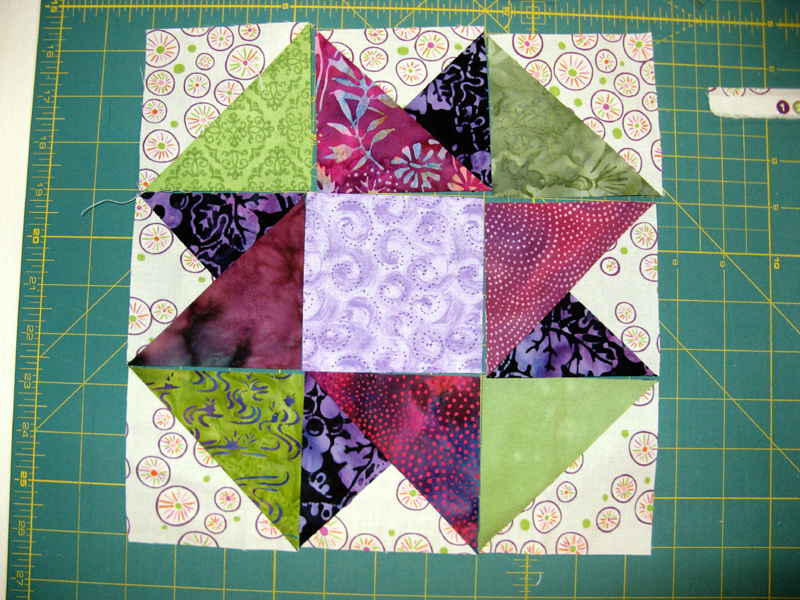 There are six other blocks to make in this quilt along. I will be putting all these blocks together into a sampler when its done. 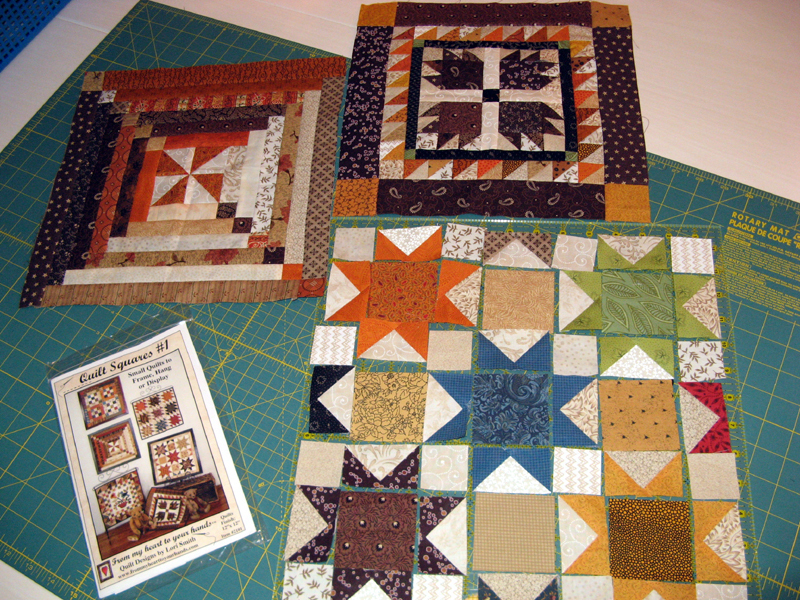 These blocks are designed by Lori Smith in her Quilt Squares #1 pattern. I'm participating in Judy's 2012 UFO Challenge with Patchwork Times. #10 was selected for April. For me it happens to be Indigo, one of her FREE designs that you can get on her website. I haven't spent time yet figuring out what fabrics I'll use. Hopefully I'll have enough of what I need already and be able to use up more of my stash :)! Finally I spent much of the day continuing work on HSTs for Autumn Rush, Myra Mayh's design. I've been spinning the seams too! 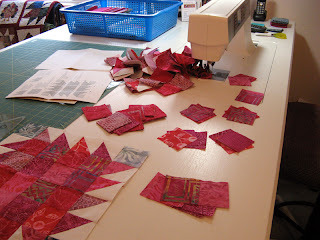 I still have a stack of pink HSTs to sew. The grays and turquoise HSTs are finished. 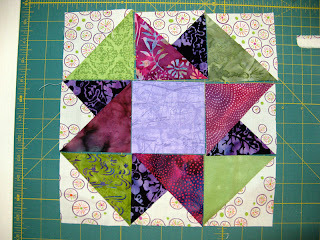 Next it will be ironing and squaring up with my trusty Bloc-Loc square up ruler. No progress on Klunky Korners since yesterday. 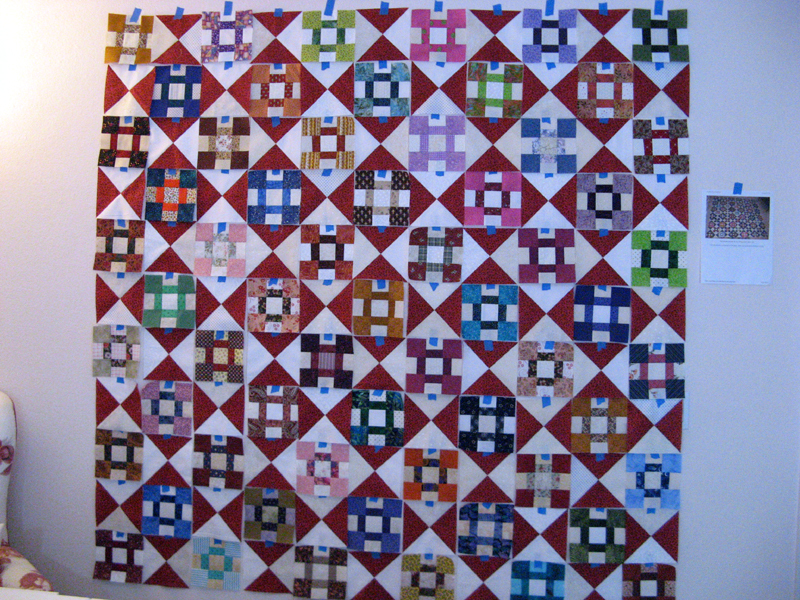 It is all still on my design wall held up by blue painters tape... Find time to see other quilters' projects at Patchwork Times. Have a wonderful first week of April. Happy April...Happy April's Fools Day. No jokes to play on you today. I'm sure you're getting at least one or two from your family (especially the kids) and friends (the ones that always give us a chuckle). Today the last day of the weekend and since I didn't win the Mega Million back to work tomorrow! Darn it wish it could have been me. My list of five and the mega number only came up with one...not even enough to win the lowest cash out of $3.00. Oh well my congratulations go out to all the lucky ones. Today I've got nothing to change on my stash report but I'm getting close. Klunky Korners when finished will be 9 1/2 yards the way I'm calculating it. Those of you who know Bonnie Hunters designs know that she doesn't always calculate yardage so I calculate in square inches rounding up a bit to capture the seams. 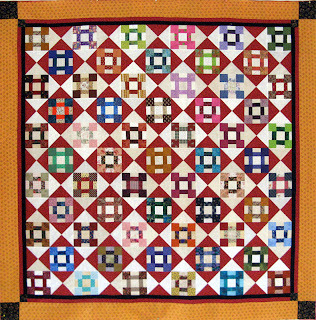 This is Chunky Churndashes FREE on Bonnie's Quiltville. 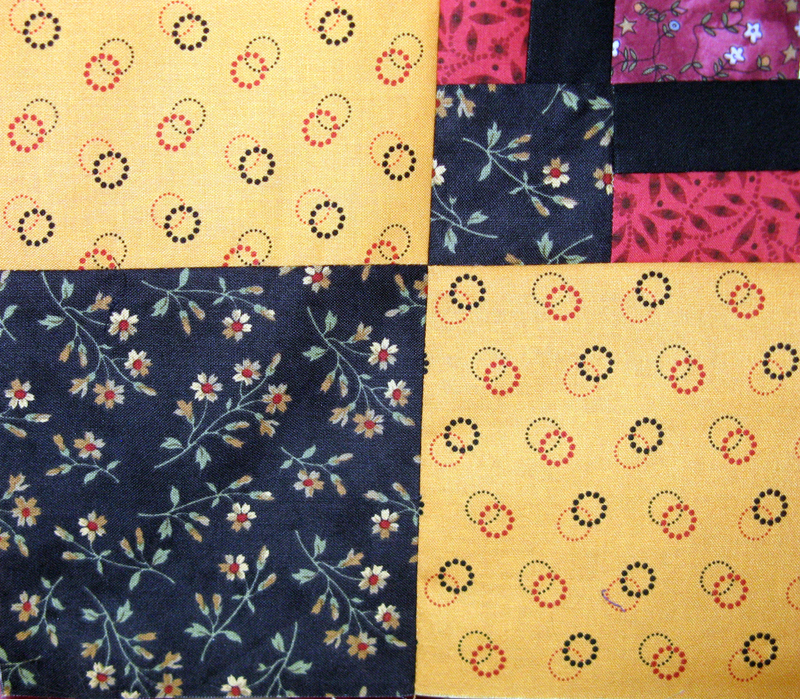 It was made with several others as part of a swap. 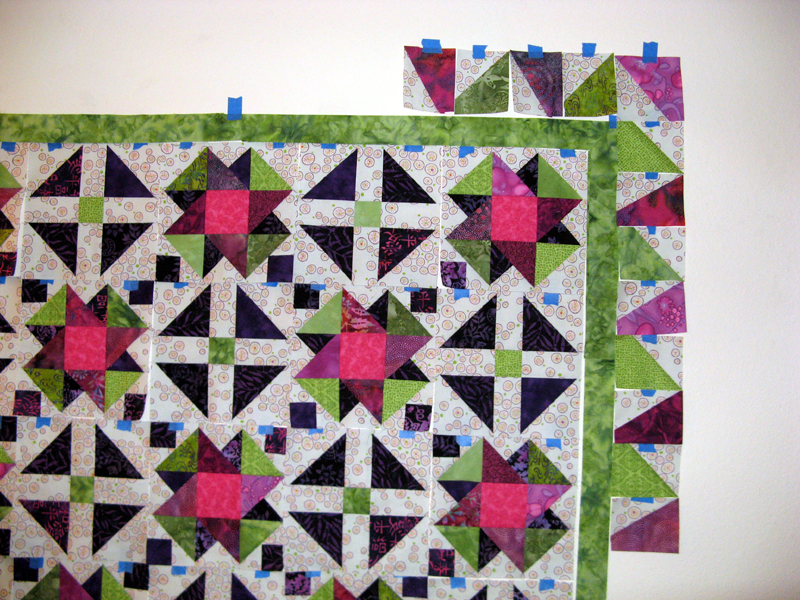 I have two borders to figure out one smaller and the other 5" or so. 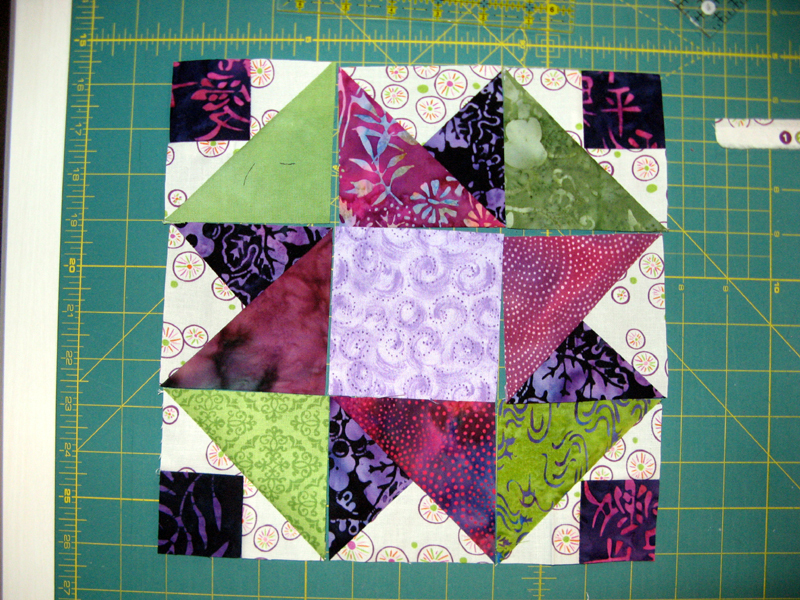 Then I'll be using anything 10 1/2" square for the back. I'll need about 81 squares. If you are trying to use up your stash this is an excellent way. I'm working today on two other projects as well while the washer and dryer or going. 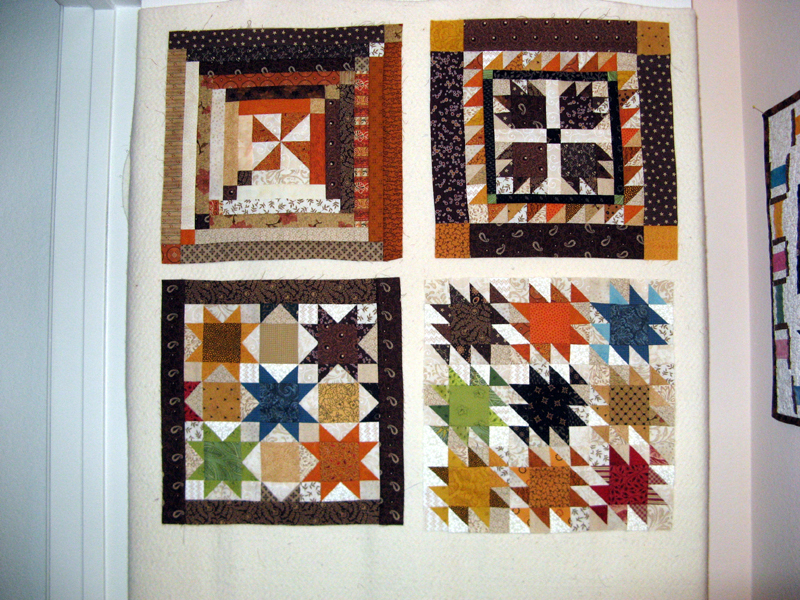 Autumn Rush a design by Myra Mayh is keeping me very busy with HSTs. It's got 320 of them. 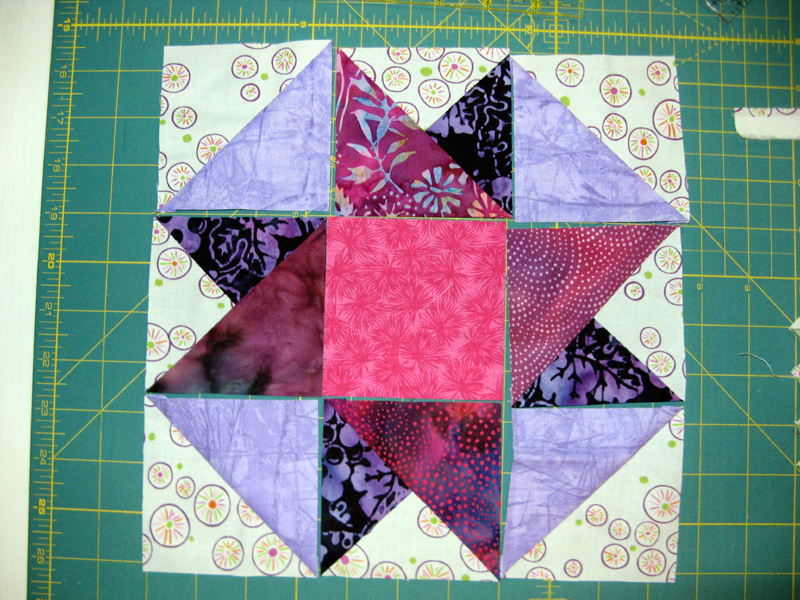 I've got my Bloc-Loc square up ruler getting a workout squaring up all these 2 1/2" HSTs. Today is the day or the third block of Lori Smith's Quilt Squares #1 pattern. 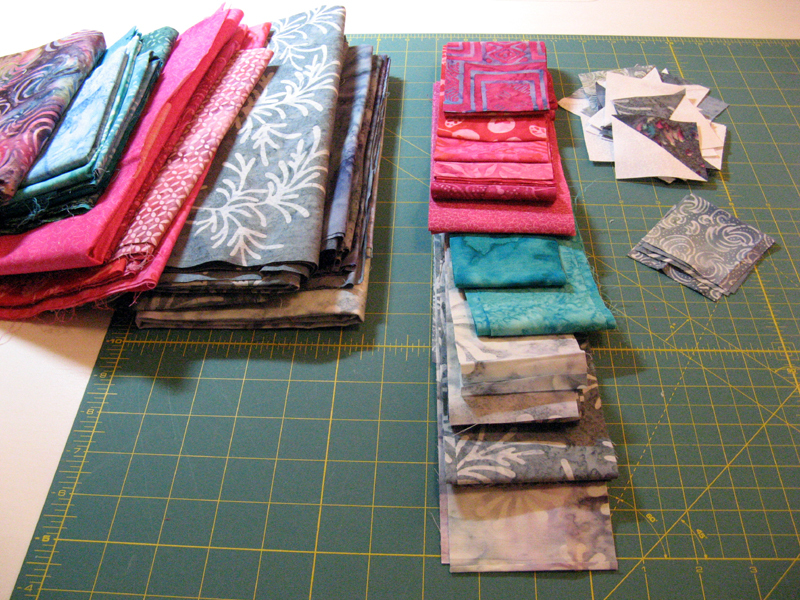 The pieces are all cut and ready for sewing. I will be introducing blue into this block and bringing in more of the green that I used in the second block. This is the project under the needle this morning. So here's my report and I am looking ahead for another change in numbers next week. Happy sewing everyone.